I really love to use product on my hair and skin that do not have harmful chemicals in them. It's hard to find products like that in most stores. I have so many allergy issues with sulphates, that I have to be careful about what I use on my skin. The last time I used a product that had sulphates in it I broke out in hives so bad that I had to go in to get a steroid shot to get them to go away. I'm happy there are companies out that that have products I can trust. The company Insta Natural sent me 3 products: Deep Cleansing Facial Oil, Moroccan Rose Water, and Vitamin C Serum to review! 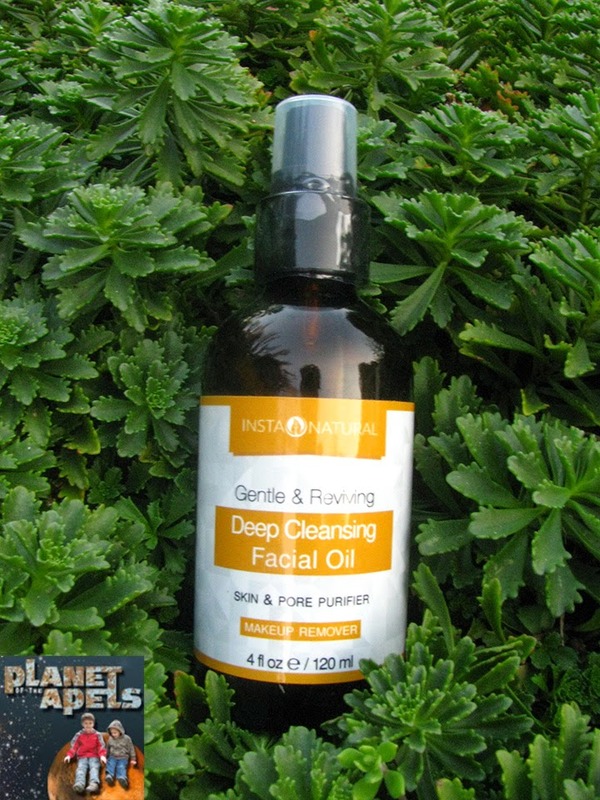 Deep Cleansing Facial Oil is $49.95, but marked down to $29.95 on Amazon. It's a makeup remover. I have to be honest that I get lazy in the day, and sometimes forget to wash my makeup off. Not only that I have sensitive skin where my face doesn't like harsh soaps. Now that I have a product that's geared towards taking my makeup off I'm changing my ways. You just apply a little bit to a washcloth, pad, or cotton ball. I've actually been using a baby washcloth on my face. They are not being used on baby's, a so soft, so why not use them on my face? :) Wipe off makeup. Rinse with warm water, and pat dry. Organic Jojoba Oil, Olive Oil (Olea Europaea), Lavender Essential Oil, Geranium Essential Oil Passionflower (Passiflora Incarnata), Hemp Oil (Cannabis Sativa Oil), Camellia Oleifera Seed Oil, Tamanu Oil (Calophyllum Inophyllum), Sea Buckthorn Oil (Hippophae Rhamnoides), and Wheat Germ Oil (Triticum Vulgare). All ingredients are to be used on skin only. I was worried about the scent because there's lavender oil in it. I just don't like the smell of lavender. It really doesn't have a strong odor. It most certainly left my face feeling soft. Moroccan Rose Water is $24.99, but marked down to $12.97 on Amazon. It's the ultimate facial toner. Avoid contact with your eyes. This product has many uses. It's meant to maintain the PH balance in the skin. It tightens the pores in your face. Apply in an upward fashion with a cotton ball on your face or neck. You can use it on your hair to make it shiny. I haven't used it this way just yet. Apply into your scalp, let it sit for 20 minutes, and was your hair with your normal shampoo. You can also add it to your bath. This slightly scents your bath water, and makes it much more relaxing. Other uses: Acne, Sunburn, Aftershave, Blemishes, Aromatherapy, and more. 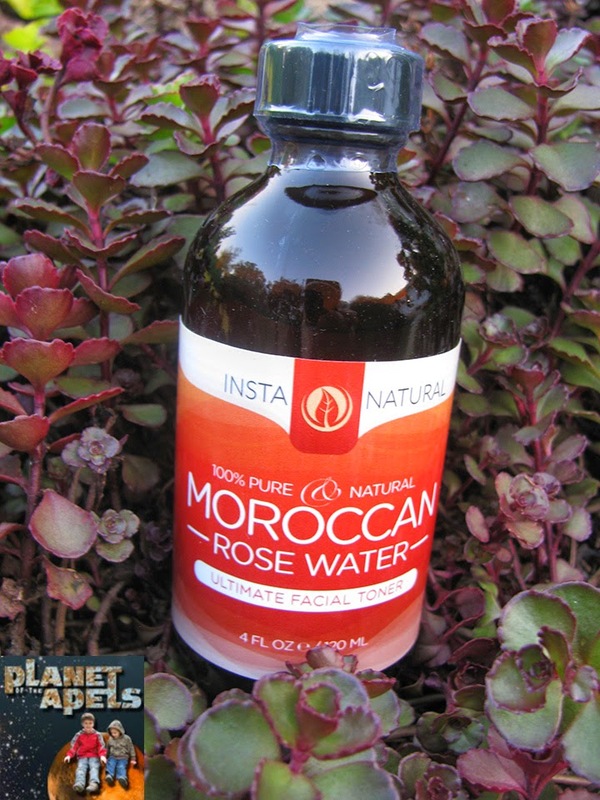 100% Pure Moroccan Rose Water (Rosa Damascena). All ingredients are to be used on skin only. I love that there's so many uses for this product! 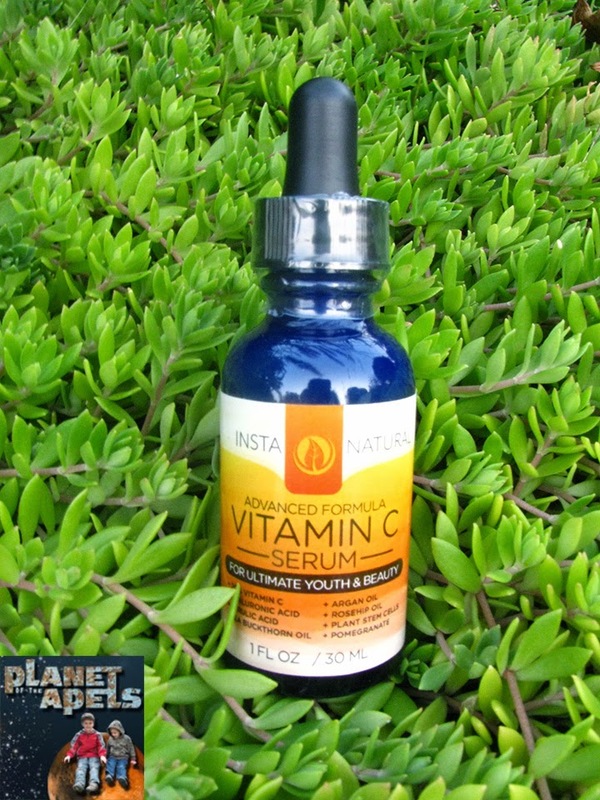 Vitamin C Serum is $49.95, but marked down to $16.97 on Amazon. That's quite a savings. It's used under makeup, and can be applied morning and night. This product acts as a follow-up to the toner listed above. Apply with a cotton ball on your face or neck. Deionized Water, Organic Aloe, Vitamin C (Sodium Ascorbyl Phosphate), Hyaluronic Acid, Witch Hazel, Plant Stem Cells, Algae Extract, Japanese Green Tea Leaf Extract (Camellia Oieifera), Organic Rosehip Seed Oil, Organic Argan Oil, Sea Buckhorn Oil, Pink Grapefruit Essential Oil, Carbomer, (2s) -2-Amino-5-Guanidionopentanoic Acid, Kosher Vegetable Glycerin, Organic Jojoba Oil, Vitamin E (Tocopheryl Acetate), Pomegranate, Organic Carrot Seed Oil, Apricot Kernel Oil, Organic Gotu Kola, Wildcrafted Horsetail, Wildcrafted Dandelion, Wildcrafted Wild Geranium, Phenoxyethanol, and Ethyl Hexyl Glycerin. All the products go so well together. They seriously make my face feel like it's glowing! I received Insta Natural products in exchange for writing this post. I only recommend products or services I use personally and believe will be good for my readers. I wonder how this would work on OLD skin. Old being the key word. I would love to find something to help with WRINKLES. Sulphates are so bad. I try to avoid them too. This is the first time I've heard of Insta Natural. I might have to look for these. Thanks for sharing your review. Have a terrific night. I bet that smells amazing. I would love to try this. Insta Natural has some great products. I still use their Argan Oil on my hair and face regularly. It works so good!